Acts 20:17 From Miletus he sent to Ephesus, and called to himself the elders of the assembly. 2 Timothy 4:20 Erastus remained at Corinth, but I left Trophimus at Miletus sick. 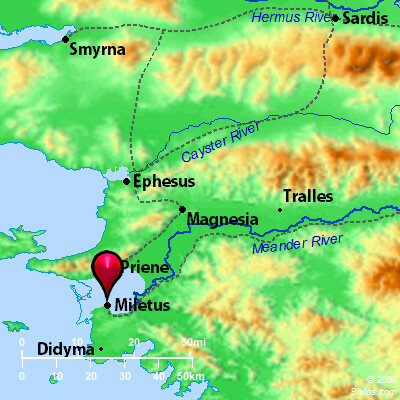 mi-le'-tus (Miletos): A famous early Ionian Greek city on the coast of Caria, near the mouth of the Meander River, which, according to Acts 20:15-21:1, and 2 Timothy 4:20 (the King James Version "Miletum"), Paul twice visited. In the earliest times it was a prominent trading post, and it is said that 75 colonies were founded by its merchants. Among them were Abydos, Cyzicus and Sinope. In 494 B.C., the city was taken by the Persians; it was recovered by Alexander the Great, but after his time it rapidly declined, yet it continued to exist until long after the Christian era. In the history of early Christianity it plays but a little part. The Meander brings down a considerable amount of sediment which it has deposited at its mouth, naturally altering the coast line. The gulf into which the river flows has thus been nearly filled with the deposit. In the ancient gulf stood a little island called Lade; the island now appears as a mound in the marshy malarial plain, and Palatia, the modern village which stands on the site of Miletus, is 6 miles from the coast. Without taking into account the great changes in the coast line it would be difficult to understand Acts 20:15-21, for in the days of Paul, Ephesus could be reached from Miletus by land only by making a long detour about the head of the gulf. To go directly from one of these cities to the other, one would have been obliged to cross the gulf by boat and then continue by land. This is what Paul's messenger probably did. The direct journey may now be made by land. Miletus has been so ruined that its plan can no longer be made out. Practically the only remaining object of unusual interest is theater, the largest in Asia Minor, which was not built in a hollow of the hillside, as most ancient theaters were, but in the open field. MILE'TUS, a city of Asia Minor, in Caria, and 30 ms. s.s.w. from Ephesus, on the seashore, about 600 ms. n.w. from Jerusalem, some ruins of an enormous theater and of a church, remain. In 2 Tim. 4:20 it is written Miletum.